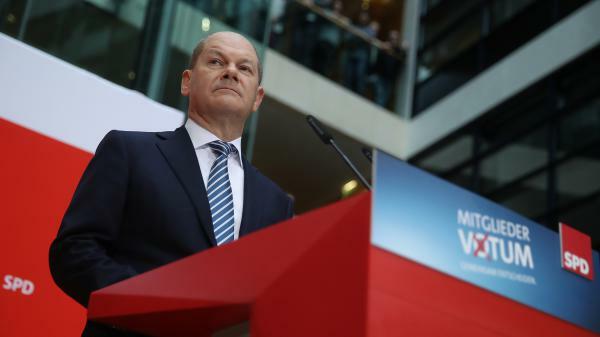 Acting chairman of the Social Democrats (SPD) Olaf Scholz announced that party members backed forming a new coalition government with Angela Merkel's Christian Democrats. Just over 66 percent of more than 360,000 Social Democrat party members who voted by a mail-in ballot endorsed a deal struck last month by party leaders to form a new coalition with Merkel's center-right Christian Democrats. The Social Democrats have more than 463,000 members. "This wasn't an easy decision for the SPD," acting party chairman Olaf Scholz said Sunday in Berlin, Deutsche Welle reports. "In the discussion [about the deal], we've come closer together. That gives us the strength for the process of renewal we are embarking upon." NPR's Soraya Sarhaddi Nelson in Berlin says that many rank-and-file members of the SPD "remain uncomfortable about partnering with the conservatives because they blame their last joint coalition for the voter backlash last September that left them with historically low returns. "But growing German frustration since then over the lack of a new government and concerns that new elections could lead to even worse results for the SPD led most of the party's critics to back down." Merkel has already led Germany for more than 12 years. The deal will form her third grand coalition during her time as chancellor, according to DW. "I congratulate [the SPD] on this clear result and look forward to further cooperation for the benefit of our country," Merkel said in a translated Twitter statement. German lawmakers are expected to re-elect Merkel as chancellor on March 14.